That story stuck with me. Although the facts were identical to my version of the story and his, the stories were vastly different. It’s easy to feel like you are in darkness—to feel disappointed, and before long it is easy to feel like the victim—like some grand conspiracy in the universe has targeted you. Maybe your story is that your boss is doing everything to hold you back. Truth is, life happens. How you tell the story makes all the difference. Last year I read Man’s Search for Meaning. In it, Viktor Frankl recounts the horror of the concentration camps and the utter fall from dignity that so many endured in which few survived. Like Job everything that “mattered” was taken from the survivors who were worked literally finger to the bone. 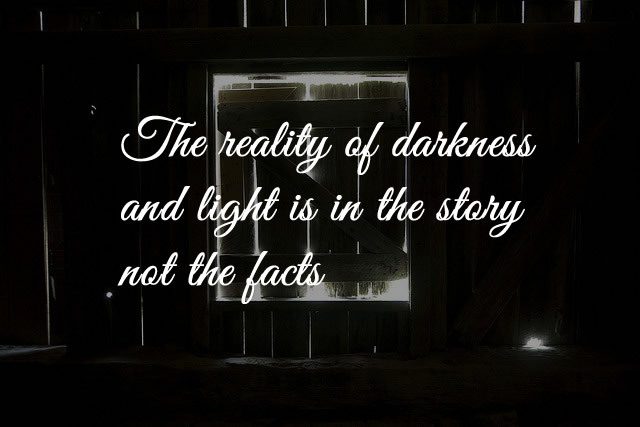 In utter depravity and injustice, Frankl found that stripped of everything he had worked to build he was forced to tell the story to see the light. No one said this journey would be easy, nor satisfying. But everyday the same facts are there. The difference is how you tell the story. How do you tell the story to yourself? How do you tell it to others? Don’t tell the story of the victim, it ends badly. Look for the light and hope in the nooks and crannies, try telling that story—the story of the victor. Thanks jpsphoto for use of the image.